The UCLA Samueli School of Engineering officially opened its newest building, Engineering VI, in grand style with hundreds of alumni and friends touring the state-of-the-art facility. With 150,000 sq-ft of added research and teaching spaces, the new building’s debut signals a new era for UCLA Samueli — one focused on fostering life-changing breakthroughs that address the toughest challenges of the 21st century and educating some of the world’s most innovative problem solvers. The ceremony kicked off with remarks from Chancellor Block, who said the building was a physical reminder of the university’s commitment to discovery and that it will help the school continue to attract the best and brightest students and faculty members. 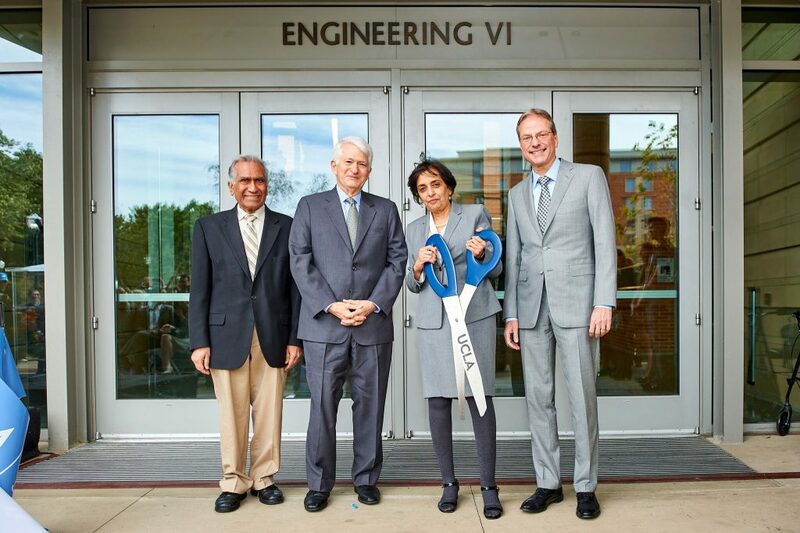 From left: Vijay K. Dhir, former dean and distinguished professor, UCLA Samueli; Chancellor Block; Dean Jayathi Muthy; and Henry Samueli. Read more on UCLA Samueli Newsroom.